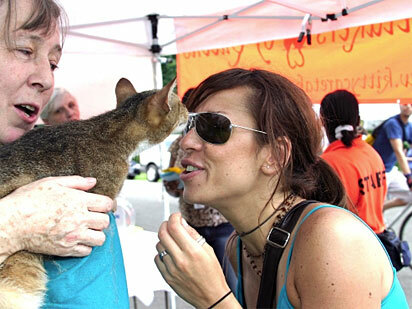 Start spreading the news… Washington Square Park is going to the dogs, cats and pet lovers on Saturday. Adoptapalooza will be the place to meet your four-legged soulmate — and have a lot of fun. The fur-in legion will be ready to roll at 11 a.m. and beginning at noon raffles will be held every half hour. You could win cool stuff from Camp Bow Wow, Desert Essence, Elmo’s Closet, Eskayel, Fido Friendly Magazine, FUR by J Mikel, Greener Pup, Kipling, Pet Central, The New York Dog Shop, Rescue Chocolate, Sequoia Paris, ShoptheLook.net, S’more Smoochies, TD Bank, W Hotels, and lots more. But first and foremost, find your new best friend. Adoptable cats and dogs from Animal Care & Control of NYC, Sean Casey Animal Rescue and the Picasso Veterinary Fund will be on three North Shore Animal League America adoption vans. courtesy: Mayor's Alliance for New York City Animals. Each person who adopts a dog or cat at Adoptapalooza will receive a free gift bag. Petographs will offer photo sessions with dogs and owners (what about cats?). For peoplewatchers: “High Society” realty star Tinsley Mortimer; NFL Insider and ESPN contributor, Adam Schefter; Shallon Lester and Sarah “Klo” McLynn from MTV’s “Downtown Girls”; and indie-rockers Care Bears on Fire are scheduled to appear. Complete list of Adoptapalooza events. Adoptapalooza is sponsored by the Mayor Alliance for NYC Animals.